Superdry men’s Ultimate Snow Rescue Jacket. This hooded snow jacket features a drawstring hood, with a hook and loop fastening on the front, a double layer zip fastening, a detachable powder skirt and a snow seals to keep the moisture out. 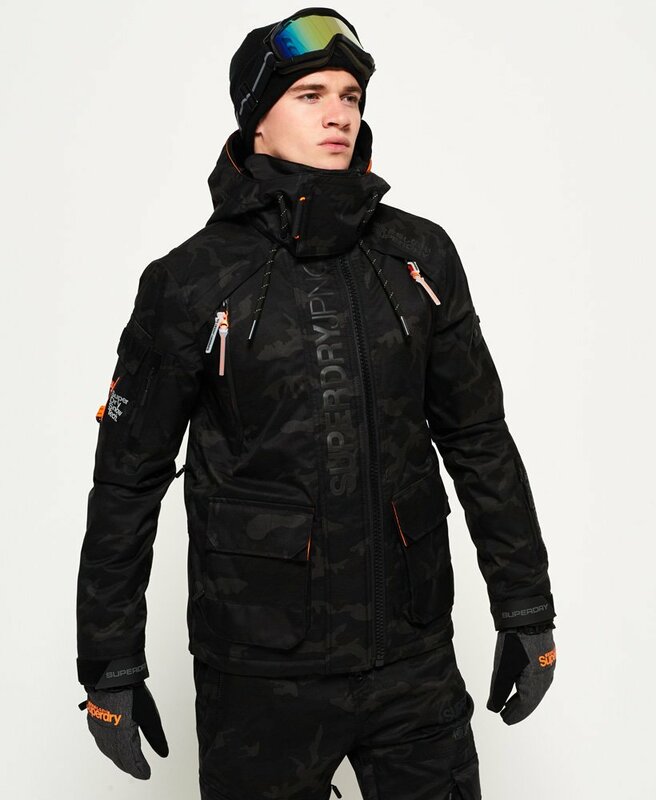 This jacket also has eleven external pockets including a tech pocket for earphone cable routing with a goggle cleaning cloth and a zipped ski pass holder pocket on one arm. Featuring a variation of adjustable straps and cords on the cuffs and hem to guarantee a comfortable fit and underarm vents to prevent overheating. This jacket is finished off with an internal zip pocket underneath the powder skirt, removable cuff lining with thumbholes, Superdry branding on the arms and the shoulder and the external pocket on the right sleeve, as well as a Superdry logo near the zip and two Superdry badges on the left sleeve.